A macro fails when launched through Geocue Dispatch. Checklist Step Details, System Messages error reads “No design files on the working segment”. Additionally, reviewing the Sub Tasks for the specified task on the Dispatch Manager reveals the machine timing out and returning to pending queue. Fig.2: Message from Sub Tasks from the failed macro. 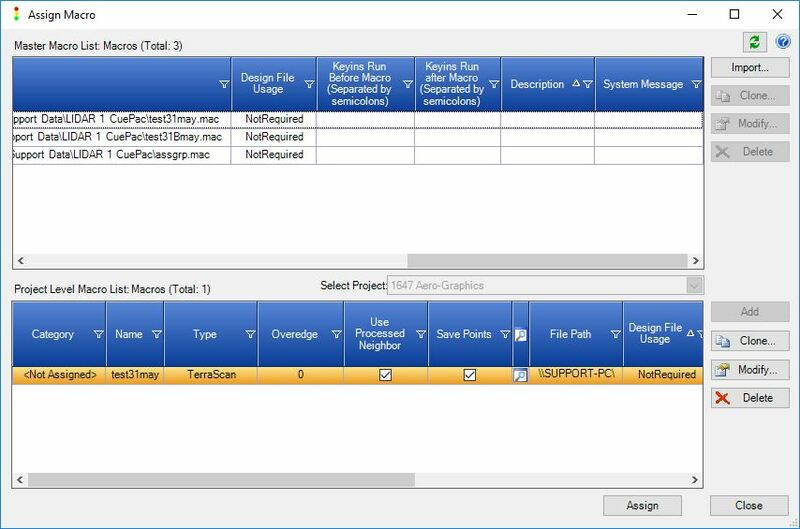 If the macro is set up to run in TerraScan: Your macro may require design file usage and there is no design file on the working segment. You can check to see if the macro is set up to require design file usage in the macro list. Fig.3: Checking Master Macro List/Project Macro List for required Design File Usage. If the macro is set up to run in TerraSlave: The TerraSlave .exe file may not be in the default folder or the one specified by the registry entry. When this happens, Geocue will attempt to run the macro in TerraScan, but fails because of no design file associated with that working segment. See Probable Resolution #1. This entry was posted in GeoCue Tools, Tips and Workflows, Terrasolid Tools, Tips and Workflows.